Procurement of Information and Communication Technology (ICT) is a priority of the CSU Accessible Technology Initiative. 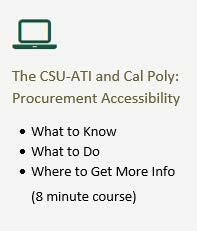 To comply with federal and state law and CSU policy, Cal Poly must apply the established Information and Communication (ICT) standards to Information and Communication Technology (ICT) products and services that it buys, creates, uses and maintains. It is the University's responsibility to obtain the most accessible product or service available that meets the business and functional requirements. Obtaining an accessible product at the outset is generally less expensive and performs equally or better than an inaccessible one. Web-based information and applications, e.g., websites, online surveys, "cloud based" services, subscriptions, and other content, social media sites, etc. Telecommunication products, e.g., telephones, cell phones, PDAs, etc. Video and multimedia products and services, e.g., TV displays and tuners, projectors, media players and recorder, and mediated content such as DVDs, etc. Desktop and portable computers, e.g., monitors, input devices, storage devices, etc. In general, if a product fits into one of these categories, requires user interaction, and involves creating, converting, transferring or duplicating data or information, then it is probably covered. In addition to being reviewed for accessibility, campus policy requires that Information and Communication Technology (ICT) products and services be reviewed for compliance with existing security and technical standards. The current criteria for review are noted in the Information and Communication Technology (ICT) Decisions Standard. However, any Information and Communication Technology (ICT) product or service may be subject to review based on its potential impact on campus users. Visit the United States Access Board for more information about Information and Communication (ICT) standards. Access to information and communication technology (ICT) is addressed by Board standards and guidelines issued under Section 508 of the Rehabilitation Act and Section 255 of the Communications Act. Requesters gather and submit information using an online form in accordance with the Information and Communication Technology (ICT) Decisions Review Process. Prior to making an Information and Communication Technology (ICT) decision, especially one involving a new product or service, it is important to consult with your management and IT support and ITS to assess the priority, resource implications, potential impact and alternatives, and available tools to meet the need. If a product isn't fully accessible, the requester must develop an Equally Effective Alternative Access Plan (EEAAP) (Word) describing how equivalent access will be provided for users who are likely to experience difficulties using the product due to any identified accessibility gap. Websites and web-based applications, including social media sites, online surveys, and other web-based services, whether developed or hosted on or off-campus, must comply with CSU Accessibility Technology Initiative requirements.